While transferring some old files to a new computer, I found these photos of a walled public garden near the château in Blois, France. I took them in the spring of 2007. The garden was designed by Gilles Clément and was built in 1987. The section I photographed is a wonderful blend of the structured (hedges set in strict lines) and loose (grasses, large rosebushes, and tall perennials planted between). The tops of the yew hedges are not level, but are sheared into rolling curves. With the grasses moving in the wind between them, you sense the motion of waves, even in this very formal garden layout. I wish I knew the name of that grass. You can read about Gilles Clément in a brief article from the February 2010 issue of Garden Design. 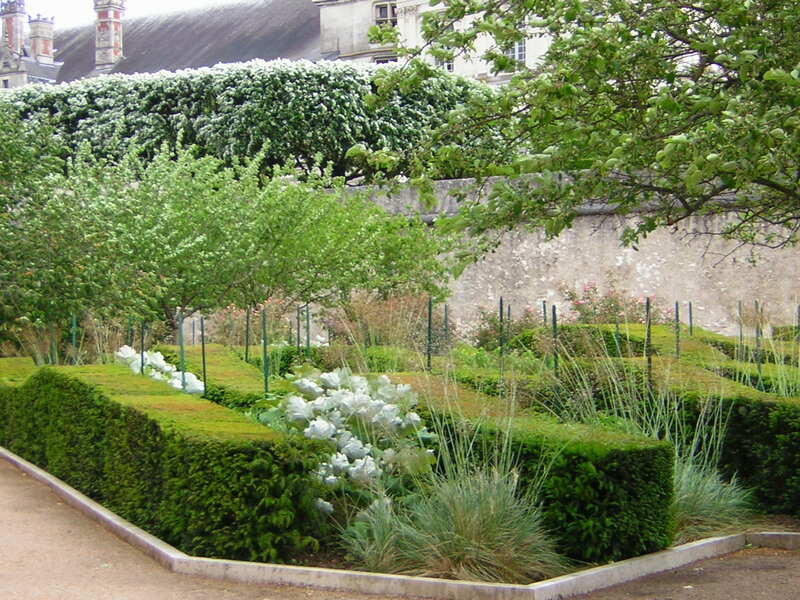 He also designed the more well-known Moving Garden at the Parc André-Citroën in Paris. Click on any thumbnail photo below to scroll through all the enlarged pictures. The Royal Gardens, Blois. The central fountain. I read that the garden sits over an underground car park. I wish I knew the name of that grass. The hedges are yews. From an upper garden section and with a view of the chateau in the distance. The big rosebushes are Rosa mutabilis, if I remember correctly, which is such a great rose. I wish I had room for it. Emerging plants. We were there in May. An upper garden section with irises and grasses. A view from the upper garden. Another garden section with a more traditional park design. I love the rolling hedges…very nice. Thanks for sharing these photos and this garden. And welcome to Blotanical! Thanks! You’re my first reader — if you don’t count my daughter, who I made look. Love, love, love this! I recently planted a ‘Lime Walk’ backed by a cedar hedge (still very tiny). I was going to cut it level, but | love the movement of this hedge, and no one could tell if I screwed up either, lol. I wonder how long it takes to get yew big enough to shape like that? The grass looks like Helictotrichon sempervirens.